Dry skin can occur just about anywhere on your body, but when it develops around your mouth it’s especially noticeable. Here are the possible causes, as well as what you can do to make your skin look and feel better, faster! Dry skin can occur just about anywhere on your body, but when it develops around your mouth it’s especially noticeable—and often embarrassing! This doesn’t just happen to people with dry skin, either; even if your skin is oily or otherwise normal you can still experience some dryness in the mouth area. For some people, dry skin around the mouth is a chronic, ongoing condition. For others, it can pop up seemingly at random, even if the rest of their skin isn’t dry. Although the reasons can differ depending on the person (and it’s best to check with a dermatologist if the issue is persistent), here are some of the most common causes of dry skin around the mouth. Seborrheic dermatitis: More common in people with oily skin, this is caused by the overproduction of oil combined with irritation from a type of yeast that occurs naturally on skin. For some people, this yeast can result in dry, flaky skin. Since there are oil glands on the sides of the nose, this can result in the condition becoming apparent in areas close to nose, which of course includes the mouth. 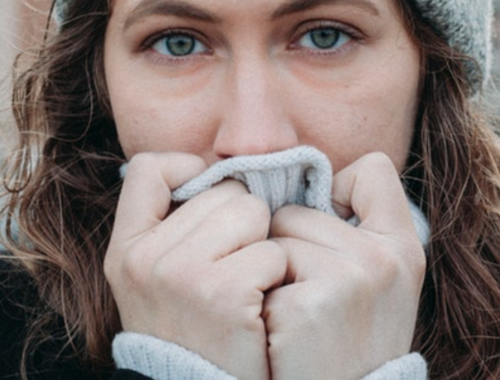 Climate changes, lip licking, and certain medications: Changes in weather, such as very cold temperatures and dry or windy conditions can cause skin to become chapped and dry. Lip licking and drooling (while you sleep; yes, it happens to everyone from time to time) are other causes, since saliva can remove naturally-secreted oils in the mouth area that normally keep it moisturized. There are also certain medications (both topical and oral) that can lead to dry skin, such as some prescription acne medications like tretinoin and antibiotics like tetracycline. When you experience dryness in the mouth area, the best thing to do is treat it with gentle skincare products free of fragrance and known irritants, since these often make dry skin worse. If you are using a lip balm, lipstick, toothpaste, or mouthwash with a high amount of alcohol, essential oils, or mint, consider alternatives that don’t include these ingredients (such as fragrance-free lip balms and alcohol-free fluoride rinses). In the case of toothpaste, it can be hard to find one that doesn’t contain some amount of mint! You can prevent irritation by using a gentle cleanser to wash the area around your mouth after brushing to remove any toothpaste that might be on the outside of your mouth. Using a moisturizer for your skin type after cleansing can help seal in moisture to keep skin from getting drier throughout the day. If skin is severely dry to the point of cracking, a petrolatum-based product (once again, free of fragrance or irritants) can provide the sort of heavy-duty moisture and protection skin needs to heal sooner. For a less greasy, extra-healing option, try Paula’s Choice Lip & Body Treatment Balm. If the dry skin around your mouth is persistent and doesn’t seem to be getting better with moisturizers, speak to your doctor about the potential causes, since it could be the result of a medication you’re taking, or a medical condition that needs treatment with prescription topical products. While dry skin around the mouth can be a frustrating, often embarrassing hassle, knowing its potential causes, what to avoid, and what to use to improve its appearance will set you on the path to clearing up this bothersome issue as quickly as possible. Now that’s something to smile about! Lipozencic J, Ljubojevic S. Perioral dermatitis.Clin Dermatol. 2011 Mar-Apr;29(2):157-61. Zirwas M, Otto S. Toothpaste Allergy Diagnosis and Management. J Clin Aesthet Dermatol. 2010 May; 3(5): 42–47. Lim GF, Cusack CA, Kist JM.Perioral lesions and dermatoses.Dent Clin North Am. 2014 Apr;58(2):401-35.